Most customers receive within 6-10 days. 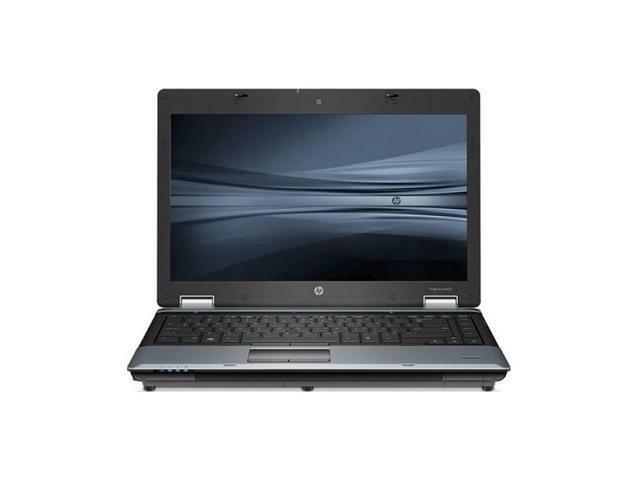 For all of your computing needs, look no further than the HP Probook 6450b. This professionally-refurbished, sleek and high performance laptop offers the flexibility, speed and power required to multitask and handle memory-intensive applications. This laptop features an antiglare-coated 14" (diagonal) backlit-LED display, and comes with a powerful Intel Core i3 processor with a clock speed of 2.27GHz for lightning fast computing, 2GB of RAM for efficient multitasking and handling memory-intensive applications, a 160 GB HDD for storing all of your essential files, an integrated High Definition Audio chip, a DVD-RW optical drive and an internal wireless adapter for easy wireless Internet access. Also pre-loaded onto this HP Probook 6450b is a genuine installation of Windows 7 Professional. Pros: I was looking for a work-a-day laptop for my daughter (teacher) to compliment her desktop. It was a little on the slow side but served it's intended purpose, mainly correspondence and paper writing. Cons: Hard drive didn't last very long. It quite after 14 months. I'm ordering a new drive to see if we can get a few more years out of it..
Other Thoughts: The price was right, but next time I will get a refurb with a manufacture date less than 4 years old. Other Thoughts: CTech has been a good communicator and helped when I needed it. I like this company, and the price was great. Other Thoughts: This was a great buy for me on newegg flash sale- tried to install 4gb mem mod but picture showed 8-chip per side low density module-was shipped a 4 chip per side high density module- my pc crashed into a continuous loop of restarting- stopped once i removed the chip. i spent some time on this and seems to be the norm for this age of laptop. also ther eis some hp software built into the power section of control panel that has quick start which i had to disable- my pc in win 10 would only restart it would not shut down via software- other than a few kinks i would say this is the steal of the century if you can find the right 4gb mem mod to install to make 6gb and clone to an ssd of your choice-it's not going to game but should get you a few years of emailing and web surfing-office programming....good luck my friends! Pros: Laptop was packed well for shipping and arrived in excellent condition. Bought refurbished before and there were always some issues with condition but not with this seller. Item looked nearly new and worked well. Early generation I3 with 2 cores and 4 threads. Great laptop for the price. Excellent for everyday use. Cons: Not really any cons at this price but touchpad did not work until I updated the driver. 2gb Ram will slow you down. Other Thoughts: I had to update the touchpad driver with version 7 -- version 1 was installed and touchpad buttons did not work. Not a scratch or mark on the laptop - nice. A lot of HP Enterprise bloatware - not really bloatware but built in security and software management for central management of laptop configuration. Removed McAfee and the HP business apps that are not needed. Was still thirsty for RAM and only 110mb of 2gb was available after boot and loading services. I added 2gb of Elpida DDR3 1333 - same as memory HP uses in these laptops -- and now running 4gb in dual channel mode. Big improvement in performance. Be advised, this comes with the original Windows Professional that was installed when new. It takes a while to get all the updates from Windows update and then you have to install SP1 for Windows 7 Pro. Took several hours to bring the OS and drivers up to date. Pros: I ordered two of these for student use. The ones I received were in perfect condition, I really don't think they were ever used! They shipped out right away and came just as advertised. You can't beat the free battery too! Cons: Its got Windows 7 without the Service Pack, so it takes a little bit to get it up to date, but I had no problems with either one of mine. Other Thoughts: Its not a really fast laptop but its a great little basic workstation. Screen and keyboard are good sized and it has plenty of ports. I am trying to think of a good reason to buy another one, this is one of the best refurb deals I have seen. Pros: I received this laptop and was very imprested with the care taken in packaging. It came with a fresh install of Windows 7 Pro 64-bit, which I have already upgraded to Windows 10. The laptop is cosmetically 9/10, with a perfect screen and only a few minor blemishes on the case. It came with a OEM HP power brick and TWO batteries, one installed in the laptop amd a seperate BRAND NEW battery sealed in an anti-static bag. Ar first I was hesitant because of the lack of a grade in the product description (I have seen "C" grades that look like they were pulled out of a fire....) but after reading the positive reviews I gave it a shot. I am definitely not dissapointed. I purchased this on sale for $109, and even after spending another $20 for an extra memory module (this laptop only comes with 2GB), I still believe I got a great deal. For the cost of a new copy of Windows 10, I got an i3 laptop with Windows 10. I have an extra SSD from my old computer that I will be installing this weekend to really get this thing going. Awesome seller, and I will definitely look here again when I need another laptop. Cons: The only con with this computer is that Windows 10 does not shutdown properly. It will restart instead of shutting down, but I have researched this and it seems to be a windows driver issue and no fault of the laptop so 5 eggs still stands. Other Thoughts: Get one while they are on sale, for $109 it's a steal! Pros: The best thing is that it came with an extra battery. Other Thoughts: I would recommend this product to my friends.